Who Is In The Middle On Saturday? Rotherham United’s home game on Saturday sees referee John Brooks in the middle. John hails from Melton Mowbray in Leicestershire and came through the ranks as an Assistant Referee before becoming the man in the middle in the Conference in 2014 and reffed the 2016 Football Conference Play-Off between Braintree and Grimsby. When he was an Assistant Referee he caused a bit on controversy at The Emirates when he urged the visiting Manchester City team to go to their fans and ‘thank them for coming and paying £62 for the privilege’. He was dropped for his next game. (Personally, I think that was a bit harsh on him – a team shouldn’t need telling to go and thank their fans in my opinion). The start of the 2016/17 season saw him move up to the Football League with the only other time he’s been in charge of the Millers being in September 2017 again at the New York Stadium when Oldham Athletic were the visitors. Michael Ihiekwe opened the scoring for the hosts on eight minutes with Oldham drawing level thirteen minutes later thanks to a Craig Davies goal. But further goals in the second half from Kieffer Moore (two), Anthony Forde and Jerry Yates gave the Millers a five-one victory. Jon Taylor saw yellow that day for Rotherham with Oldham’s Samuel Edmundson, Dan Gardner and Gevaro Nepomuceno also getting booked. In his twenty-five games so far this season, John has shown a whopping one hundred and five yellow cards and five red cards. 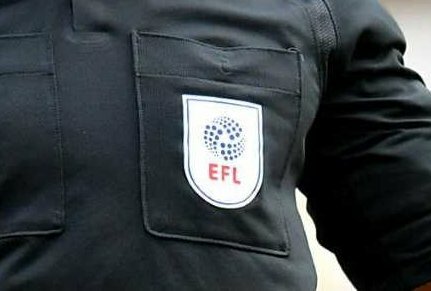 Running the line on Saturday we have Jonathan Hunt and Mark Jones and Darren Bond from Lancashire, who was last in charge of the Millers at Hillsborough in December, is the Fourth Official.